This three-story structure, at 15th and Moss, was named for Robert Sharp Bean, a UO graduate who was Oregon Supreme Court Chief Justice (1882-90). The building is comprised of two squares with courtyards, Bean West (1695 E. 15th Ave., 70,651 sf) and Bean East (1741 E. 15th Ave., 90,924 sf). Bean Residence Hall Video Tour. 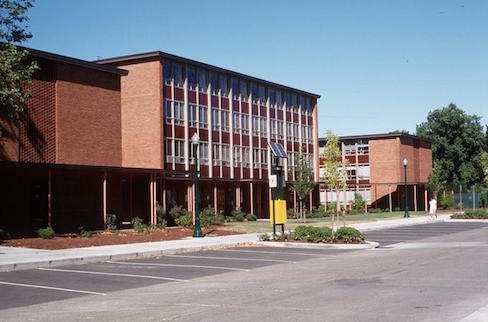 University of Oregon, 2016. YouTube. 5:46 minutes. Carey, Erin. 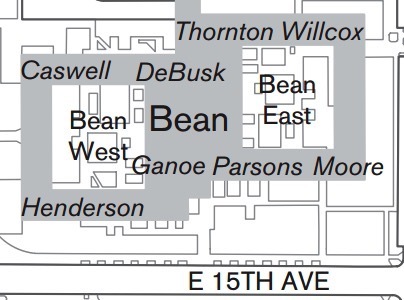 "Bean West Hall Construction Works to Eliminate Lead Pipe Problem." Daily Emerald, Nov. 5, 2017. Web. Page author: Edward H. Teague.